The Waverly Duck, in storage on a First Avenue lot, the way it looked on Monday. The aging Waverly Duck might return to the Albany pond where, tethered to the bottom, it used to float for many years, but a lot of things would have to happen first, including a successful fund drive to pay for repairs. Mayor Sharon Konopa says the widow of its owner has offered to donate the polyurethane creation to the city. On Monday, the mayor asked the city council whether it would accept such a gift with the proviso that private funds would be raised to make the duck fit for once again bobbing in the middle of Waverly Lake. There was no vote, but the council didn’t say no. What happens next, presumably, is up to the mayor or anybody else with an interest in restoring the floating attraction to the lake where it could be seen by people — especially kids — visiting Waverly Park or coming into town from the north. Created in the 1980s by Steve Fletcher, owner of Sprayfoam Inc. on Century Drive, the duck weighs either 350 or 400 pounds and measures either 13 or 14 feet in length, depending on which newspaper story you read. Mike Briggs, owner of First Stop Antiques, bought it from Fletcher for $2,500 in 1997 and, he told an interviewer later, spent $11,000 on repairs and maintenance in the ensuing years. At one time in the nineties, Waverly Duck seemed to attract the amorous attention of a visiting goose. 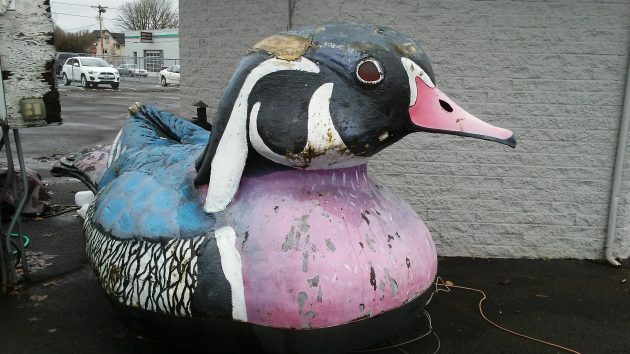 Also, though covered with fiberglass, the duck suffered the slings and arrows of a cruel fate, not to mention vandals, the elements, and waterfowl that insisted on occasionally covering it with poop. Worried about its condition, the city parks department had the duck pulled from the lake in 2007. Mike Briggs died last Oct. 23 at the age of 62. His widow, Pam, discussed the duck with Konopa in December. The mayor says that if the city takes ownership, the first step will be to determine what repairs must be made. Donations from the community would be needed to pay for any repairs. If this fails, Konopa says the owner would support the city’s finding another place, such as a private pond, for the duck. On Monday I checked on the duck where it’s been stored behind the office on the former car lot that serves as the headquarters of Corvallis Tree & Lawn Care. The owner of the business, Mark Pickens, said it would be nice if the duck could be repainted. He thought maybe the talented volunteer painters of the Albany Carousel animals could be recruited. In the meantime, he told me, he’d be glad to keep storing the duck until its fate is decided. 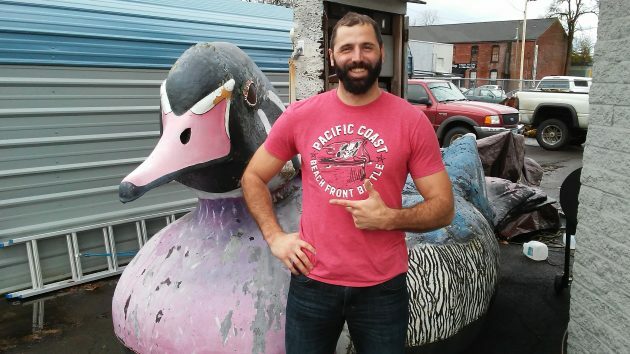 Mark Pickens has been storing the duck on his downtown lot. Of all the things that the City has funded for the beautification of privately owned property through CARA, how difficult is it to set up a gofundme for a fiberglass duck so the real ducks have a place to poop. Everytime I drive by Waverly, my head still turns looking for that floating landmark. I never realized it was the parks department that had it pulled out. From what I heard years ago the owner stole it away by dark of night, fed up with the vandalism and lack of maintenance. Hopefully it can be restored amd brought back to the lake someday. My family always referred to it as “Tacky Duck” because it is *tacky. * Spend money on something else. If City Mothers and Fathers make the determination to save the Waverly Duck, we would hope the Council would adopt reasonable zoning regulations designed to protect Albany citizens from the inevitable unpleasantness that comes with large foul. I suggest no duck anchorages within 300-feet of any school, church, synagogue or mosque. 1000′ away from any liquor store, and lastly, no where near any recreational pot store. We also strongly recommend the Council consider a 3% city sales tax on any and all Waverly Pond Duck kitsch. We hope the Council will not duck it’s duty and rule wisely. There is probably no need to drag CARA into this issue. They have enough inanimate animal challenges with all the critters on the First Street Cara-sell downtown. More than happy to spend a Saturday helping, Christina! But how the heck do I email you? While we are at it, let’s paint a beaver for the pond too! Floating civil war …everyday. A great idea to restore an Albany tradition – with volunteer work and funds. There’s no reason why the general population should be taxed for a frivolity, even if it’s a cute one. I always look for the duck whenever I drive by Waverly lake. BRING BACK THE DUCK!!!! Based on our work session, there’s no interest in having the City of Albany pay for any restoration and/or maintenance of the Duck. If the public wants it via donations, etc., that would be great and I’m more than willing to contribute to that happening.